ST. MARY CRAY TEMPLE DRAMATIC SOCIETY. 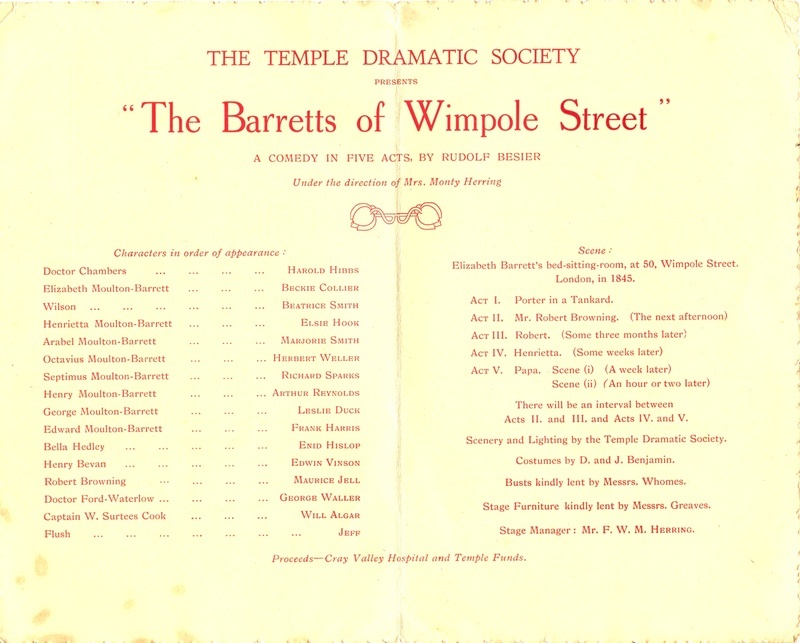 An adequate presentation of such a play as the “Barretts of Wimpole Street” is an ambitious undertaking for any amateur society, and the fact that one came away from the Village Hall, St. Mary Cray, feeling that justice had been done to the play, says much for the Temple Dramatic Society. The comedy, under the direction of Mrs. Monty Herring, was presented on Wednesday and is to be repeated to-morrow in aid of Cray Valley Hospital and Temple funds. For acting ability and a perfect understanding of her part, chief honours must go to Beckie Collier, who played “Elizabeth Moulton Barret.” Almost continuously on the stage, and with many emotional scenes to contend with, Miss Collier played with a confidence and artistry that pleased both eye and ear. Her actions, always expressive, were never strained, and she never allowed the exigencies of her part to rob her voice of its tone or clarity. Frank Harris, who took the part of the father of the “Barrett” family, “Edward Moulton Barrett,” seemed handicapped with a voice that was not quite deep enough. The tyrant was never quite convincing. The wilful “Henrietta,” sister of “Elizabeth,” played by elsie Hook, was always the rebellious but frightened child. She stormed against her father in his absence convincingly, and was suitably respectful when he was present. Enid Hislop provided a very good likeness of an irresponsible cousin, “Bella Hedley,” and showed how “father” could be “tamed” by an outsider. The parts of “Dr. Chambers” and “Dr. Ford-Waterlow” were ably taken by George Waller and Harold Hicks, both showing requisite professional restraint and pomposity. Mr. F. W. M. Herring was stage-amanger, and costumes were by D. and J. Benjamin. The Rev. T. W. Bond, minister of the Temple Congregational Church, thanked Mr. and Mrs. Herring, also the players for their performance. He stated that the society had been unable to obtain the services of some of its more experienced members. As the Rev. 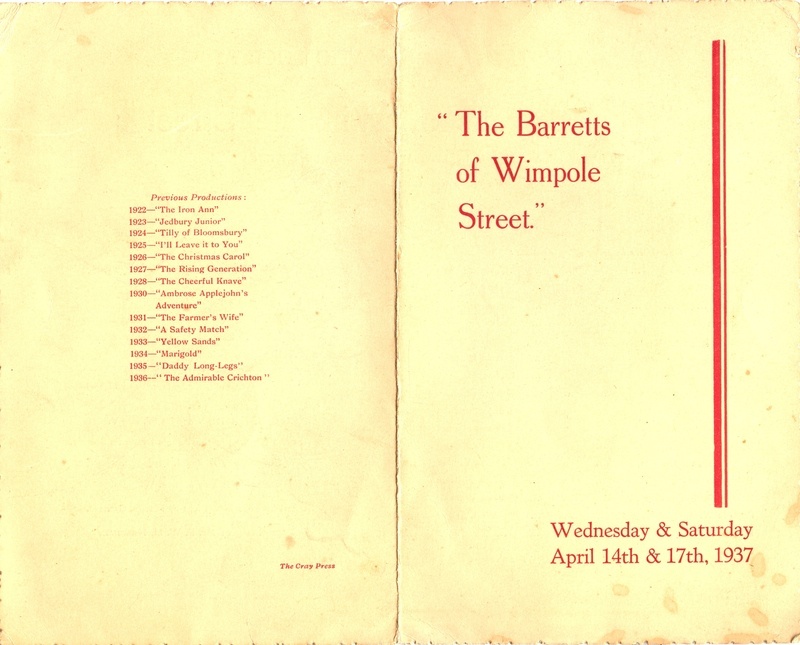 T. W. Bond aptly remarked in the course of a few remarks during the last Interval of the play at the Village Hall, on Wednesday evening, in attempting “The Barretts of Wimpole Street,” The Temple Dramatic Society had undertaken a most ambitious production. That the interest of the large audience was held for over three hours during five Acts is a complete justification of that ambition. If criticism is necessary of such an excellent performance, one”s chief criticism must be of the audience. The audience at an amateur production should come prepared to make allowances, and it does not seem necessary to increase the difficulties of the actors in what are essentially their most difficult passages, by laughing at the most sentimental crises. It says much for the actors that they were able to overcome these untimely interruptances with complete sang froid. The three most difficult parts were admirably played. Frank Harris, as Edward Moulton-Barrett, the Victorian father, almost made us believe in the old adage “This hurts me more than it hurts you.” That he did not do so was perhaps due to his being a little too stiff in his movements, he was inclined to shout rather too loudly, and his most dramatic utterances were made to the audience instead of to the person to whom they should have been addressed. During the whole of her performance, (and she was on the stage nearly the whole time) Beckie Collier as the invalid daughter, Elizabeth, was as near perfection as she could be. Not a word out of place, and with a gesture and movement exactly fitted for every occasion, an admirable performance. Maurice Jell, as Robert Browning, her lover, also did well, but was inclined to forget his words in an admirable attempt to gain expression, which he accomplished to a marked degree. Of the other parts, the most delightfully natural performance, apart from Flush, the dog, was given by Elsie Hook, as Henrietta. One could not help feeling, however, that she was 1937, in spite of the 1845 costumes, which were admirably portrayed throughout the whole play. The prize for elocution goes to Marjorie Smith, as Arabel. She was inclined to recite her part at first, but, when she overcame her nervousness, her performance was good. Beatrice Smith, as Wilson, the maid was also good, while Enid Hislop, as Bella Hedley, suffered only by comparison with the others. Of the minor men’s parts, Doctor Chambers’ (Harold Hibbs) voice and wig rather belied his undoubted bedside manner, while it is an astonishing fact with amateur productions (though quite common I may add) the smaller the part, the more the prompter’s services are required. The parts of the four sons were well acted, but the appearance of Capt. Surtees Cook’s legs suggested that he had left his spurs downstairs, as well as his sword. Edwin Vinson, as Henry Bevan, was most 1845. 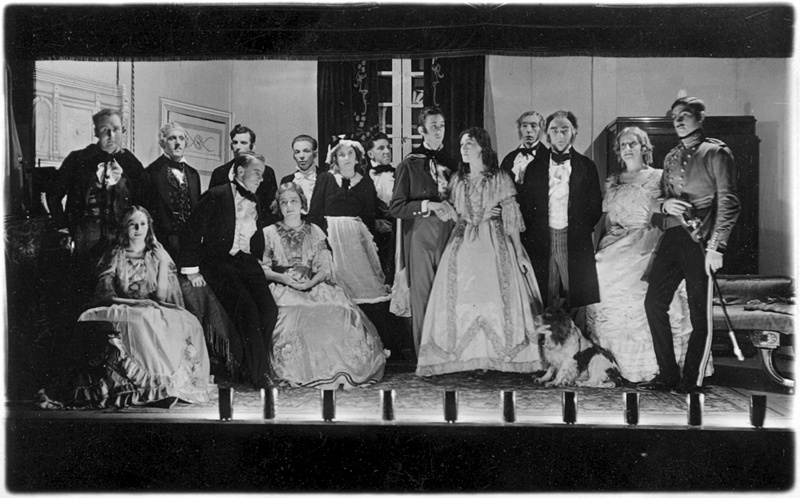 The play was well cast and well acted, while the fact that there never appeared any congestion, in spite of the small stage, is a great tribute to the producer, Mrs. Monty Herring, and the Stage Manager, Mr. F. W. M. Herring, though he did allow the crumpled letter to remain on the mantlepiece a whole week. Evidently Wilson had forgotten to dust. The excellence of the production, and the worthiness of the cause,—the Cray Valley Hospital — should ensure an overcrowded house on Saturday evening for what everyone connected with the Temple Dramatic Society has every justification for considering as one of its finest productions. Falstaff. The Temple Dramatic Society’s performance of “The Barretts of Wimpole Street” on Wednesday was a remarkable production of a truly remarkable play. The romance of Elizabeth BArrett and Robert Browning, and the reactions of the Barrett family to the cruel and perverted love of their father form the canvas upon which Rudolf Besier, the auther of the play, paints a masterly study. And how refreshing, after the clipped conversation of to-day, to have it portrayed in the exquisite English of the period of 1845, in words which could have ome from the lips of Robert Browning himself. At the first performance the audience was a little unprepared for such an artistic production, and the players had to face the disconcerting influence of an only aighty percent. reception—a few in the audience wanted to boo the villainous father and treat the play as a melodrama, which was not intended. The scene of the play, Elizabeth Barrett’s bed-sitting-room at 50 Wimpole Street was portrayed with taste and imagination. The vase of tulips and the anemones were a delightful touch, although when left on the stage throughout the production they detracted somewhat from the three or four months’ time-shift of the play. The lighting, and especially the flood of moonlight at the dramatic close of Act I, was excellently done. Although warn rather too modestly and not, perhaps, shown off as they deserved, the costumes were a treat to the lover of colour and the picturesque. It is unnecessary to single out the 16 members of the cast for special praise—the art of the theatre of corporate. But everyone would ask Beckie Collier to take a final bow. The spirit of the play came from her fine acting in the part of Elizabeth Barrett, and she again enhanced her reputation as an actress. Frank Harris played the difficult part of the father, Edward Barrett, with character and feeling, and Maurice Jell spoke the beautiful lines entrusted to him in the part of Robert Browning in a manner which would have done credit to any professional. TEMPLE SOCIETY’S PLAY AT ST. MARY CRAY. 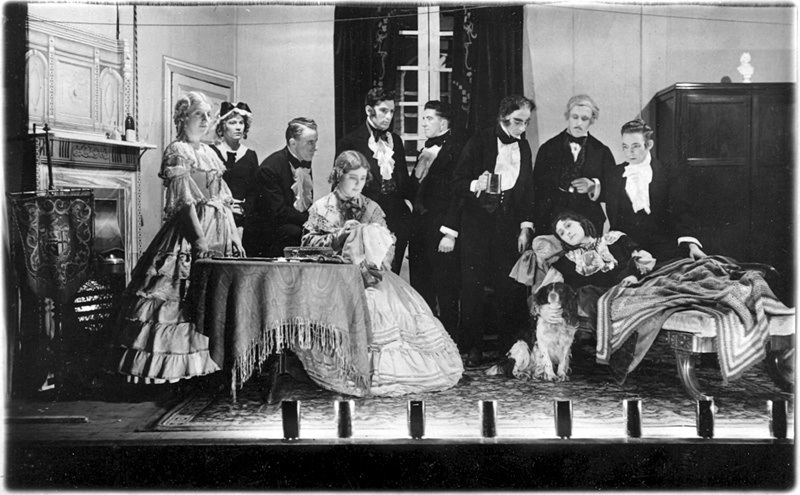 The Temple Dramatic Society selected for their fifteenth annual play Rudolf Besier’s comedy, “The Barretts of Wimpole Street,” and it proved a great attraction. St. Mary Cray Village Hall, the soceity’s centre for dramatic purposes, was not large enough to accommodate all who wished to attend on Wednesday and Saturday evening last week. Each year the soceity present a play to raise money for the Cray Valley Hospital and the Temple Congregational Church, and the combined object receives the approval and support of playgoers over a wide area. In Saturday evening’s audience, for instance, there were residents of Bromley and Sidcup. Mrs. Monty Herring directed the play, and her husband gave his services as stage manager—and everything with a swing. Beckie Collier as Elizabeth Moulton-Barrett, around whom the play was built, and she had a splendid reception. Her diction and gracefulness were perfect for an amateur, and she was an outstanding success. Maurice Jell, as Robert Browning, the poet, supported Miss Collier adimrably, and the requent scenes between them were well done. Both had difficult and heavy parts, but the acquitted themselves well. Mr. Frank Harris was the Victorian head of the Moulton-Barrett family, a role he took with dignity and firmness. There was sympathy for his daughter, Henrietta, played by Elsie Hook, who made an attempt to escape from home to marry Captain W. Surtees Cook, whose uniform fascinated her. Their meeting produced some good acting, with a clever sense of the Victorian period. Marjorie Smith played sympathetically, and Beatrice Smith, the maid, had the power of assuming a new personality when an occasion demanded it. Her handling of “Flush”—a beautiful spaniel—was a feature of the play. Other members of the cast who added to the success of the piece included Harold Hibbs, Herbert Weller, Richard Sparks, Leslie Duck, Arthur Reynolds, Enid Hislop, Edwin Vinson and George Waller. The difficulties of the small stage were overcome with astuteness, and a really creditable show was the result. Mr. and Mrs. Monty Herring are to be congratulated on teh success of their effort. The society was supported by the loan of furniture for the stage from Messrs. Greaves, of Orpington; busts were lent by Messrs. Whomes, Ltd., and the costumes were by D. and J. Benjamin. At the conclusion on Saturday evening, Mr. Will Algar invited Mrs. Monty Herring to come before the footlights to receive the cheers of the audience. Mr. Monty Herring was also received with acclamation. Bouquets were presented to Miss Collier and Mrs. Monty Herring, and Mr. Monty Herring received a gift of cigarettes. COLLECTION of letters written by Elizabeth Barrett Browning to her brother and sister auctioned yesterday throw new light on circumstances of her elopement from Wimpole Street in January, 1845. Most important collection of Browning material to appear in sale room since disposal of Robert Browning’s own collection in 1913 for £27,936, including £6,550 for the “Love Letters.” More recently 22 letters also written by his wife released £8,000 in America. The romantic elopers, a vigorous, positive husband with delicate, invalid wife, lived much in Italy, where Elizabeth died at Florence in 1861, and R. B. 17 years later at Venice. Rezzonico Palace, his Grand Canal home, death place, and where he wrote “Asolando,” has now been restored and is a museum.